Linfield's Aaron Burns opens the scoring during Saturday's game at the national Stadium Windsor Park. ('Photo Colm lenaghan/Pacemaker Press). When the going gets tough, the tough get going. Just ask David Healy! Linfield blasted their way back into title contention with this significant win against the current champions, and they are not finished yet. Aaron Burns grabbed the priceless first half winner to send the blue half of Windsor Park - there were 4,500 fans at the game - into raptures. 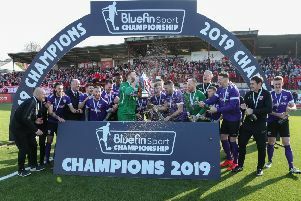 While, Healy’s troops were cheered off at the finish of a pulsating affair, the result left a huge question mark hanging over Crusaders’ ambitions to retain the trophy that has resided at Seaview for the past two years. The North Belfast team have now failed to register a win against their biggest title rivals in six outings this season. And, having suffered back-to-back defeats for the first time since August 2014, there is a certain degree of panic beginning to seep through. With only four games remaining, it’s now down to a battle of nerves. But based on this showing, it wouldn’t be a big surprise if blue ribbons replace the red and black on the Gibson Cup, come the end of the campaign. “It was a must win game for us - we needed it,” beamed Healy. “Without adding any pressure to the players, I told them a draw was no good to us. I thought we were hungrier than Crusaders. I thought we were better than them on the day. We have the best defensive record in the league and we stood firm when we needed to. “The players couldn’t wait to get out, I could see it in their eyes. You can sense it in the dressing room. You look around to see who was right up for it, they all were. “Questions have been asked; Are these players mentally strong enough to sustain a title challenge? When I first got the job, the players were labelled as not being mentally strong enough. I think they have proved they have got what it takes over the last two or three months. We don’t fear any team in this league. “They have got a bit of bottle about them. We will see where it takes us, but we are still big underdogs to life the title. “It’s (the title) still out of our hands. We have to focus on picking up three points from every game from now until the end of the season. Burns, who showed great skill to swivel and turn past Howard Beverland and Billy Joe Burns before slotting the ball past Sean O’Neill for the winner, insisted it’s probably his most important strike of the season. “It was a fantastic result,” said Burns. “We knew how important the game was. “To a man we were brilliant and I don’t think anyone could say we didn’t deserve to win it. As a front man, when the ball falls to you, your job is to put the ball in the net. Thankfully, I was able to put away the one that fell to me, it was great to see it go past the keeper. Crusaders manager Stephen Baxter pulled no punches assessing his team’s performance. “We were hopeless. It was men against boys. I told David (Healy) that his team were 10 leagues ahead of us. They were on the front foot, they were dominant and they controlled the game. They were quicker to the ball and passed it better than us. “We didn’t show up and that’s disappointing, and I told the players that. It wasn’t a performance associated with the standards we are used to. “We were edgy and nervous, couldn’t control the ball in the right areas and, when we did get one big chance to score, Heatley fluffed his lines. Had he scored, we certainly wouldn’t have deserved it because we were hopeless.